Twice in one day- again. The new tutorial is below but I thought I'd share something exciting. 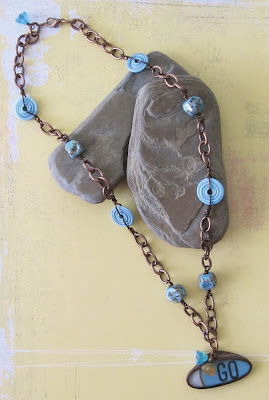 One of my BFF's (Blog Friends Forever) Christi over at 2 if by Sea is offering one of my all time favorite necklaces of hers, "go", in a Giveaway this week. Fabulous- but I love the conditions of entering. You have to PAY IT FORWARD and in order to enter, have to host a giveaway yourself. I'd been toying with the idea already, as a way to introduce you all to my new Facebook Fan Page. So I took this for a sign from above and am planning to do my own giveaway later this week. So stay tuned!!!!! PS I have a couple of Christi's necklaces and they are AMAZING!!!!!!! Great idea! I will be joining in on the fun, too. That necklace is so so cool - I just love it! I'm heading over to FB to check out your new fan page!